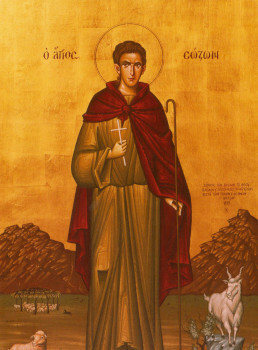 The Martyr Sozon, a native of Licaonea, was a shepherd. He read the Holy Scriptures attentively, and he loved to share his knowledge about the One God with the shepherds who gathered together with him. He brought many to the faith in Christ and to Baptism. By night-time once, when he sat under an oak tree, he had a vision foretelling his deed of martyrdom for Christ. He set off to the city of Cilician Pompeiopolis, where a festal pagan celebration was being prepared for a golden idol, standing in a pagan temple. Unseen by anyone, saint Sozon went into the pagan temple and broke off the hand of the idol, and having smashed it he gave the gold to the poor. The emperor in a fitful rage commanded that Saint Sozon be tortured mercilessly. They hung him up and struck at him with iron claws, and then they put on his legs iron shackles with nails inside and took him through the city. After this they again suspended him and beat him with iron rods until his bones broke. In these terrible torments Saint Sozon gave up his spirit to God (+c.304). By decree of the emperor, slaves set a strong fire so as to burn the body of the martyr, but suddenly lightning flashed, it thundered loudly and a strong rain poured down over the flames of the fire. Christians took the body of the martyr by night and gave it over to burial. By his grave and at the place where he had the vision, there occurred healing of many of the sick. A church later was built in memory of the sufferings of the holy martyr.